This exceptional live set was taken from a series of live performances at Le Parc du Chateau d'Herouville. Again, it must be remembered that this album is a cross-section of French rock at the time, and features progressive, as well as blues-rock, psychedelic, and folk-rock styles. Don't let that make you hesitate, though - this album is great from beginning to end, all 75 minutes of it. There are some bands featured here that you will hear nowhere else, and for other artists such as Catharsis, Catherine Ribeiro and Alpes, and Alain Markusfeld, this makes a great introduction. Ergo Sum kicks it off with a spirited version of "All's So Comic," then Magma takes over with a very early version (maybe the earliest...) of "Mekanik Kommandoh." An outstanding track by Spectre (this is their only recording!) is followed by two folk based tracks by Mor - an early band which featured Dan Ar Bras and two other guitarists. Then we move into a three track blues set with Zabu and Solitude before coming back to more progressive turf with Steve Warring (an American artist), Voyage, Design, and Contrepoint. The album then moves into near psychedelic territory with contributions by Catherine Ribeiro, Claude Engel, and Catharsis. Then a track by another American artist, Roger Masson, with the closing track offered by the Alain Markusfeld group, featuring Geza Fenzl and Joel Dugrenot. Although a few of the better known early French bands are not featured here (Triangle, Alice,etc), this is as good an introduction as any to that scene. 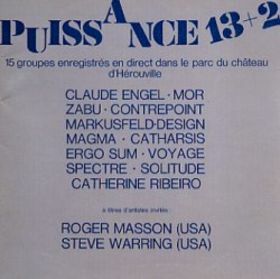 Puissance 13 + 2 presented an assortment of French bands on this interesting and varied compilation. The first song is Ergo Sum’s "All’s So Comic" that is the same track as on their Mexico release. This is a live recording jam packed full of Magma and Zao influenced French progressive jazz and fortunately minimal vocals. It is easily one of the best tracks on both discs. Next in line is Magma’s excellent example of zeuhl music: "Mekanik Kommando." The mood then shifts to a Lovecraftian synth rock anthem by Spectre called "Arkham." This song strongly reminded me of an obscure track "Xmas Hills" by an equally obscure Australian band Cybotron. Shifting musical gears again, we now hear two acoustic folk ballads by MOR. MOR was probably the French equivalent of Crosby, Stills, and Nash. Still in the acoustic mode the next song is Zabu’s unaccompanied "Informer Blues." This acoustic version sounds as if it was recorded on a porch in the Deep South. It captures the grit of Robert Johnson and Lightning Hopkins. Picking up the tempo now is Solitude with two blues rock numbers, "Been Gone So Long" and "Jappy’s Boogie." "Been Gone So Long" is straight ahead blues rock like the early output of Eric Clapton, Jeff Beck, Jimmy Page, Johnny Winter, etc. In fact it reminded me of Jimi Hendrix’ "Red House" without the guitar pyrotechnics. "Jappy’s Boogie" is a boogie woogie tune that reminded me of Nicky Hopkins’ early seventies output. Again the mood changes and we hear an expatriated American Steve Warring playing a Blue Grass rendition of "Bill Bailey" sung in French! Now things become interesting for the prog fan! The next two songs by Voyage and Design are excellent French examples of Krautrock. On the heels of Design is Contrepoint’s Canterbury jazz of "Unfathomable of the Seventh Time." Things start to get a little strange with Catherine Ribeiro and Alpes with "Aria Populaire." "Aria Populaire" has the feel of a 60s protest song but there are only Catherine’s wordless vocals. Again we are treated to some excellent acoustic guitar work in the form of Claude Engel’s "Promenade." Engel’s folky style is akin to John Fahey and Leo Kottke. Moving back towards the experimental we hear the dreamy acoustic sound of Catharsis and their outstanding contribution "Charles." "Charles" is a cosmic raga with wordless vocals, Farfisa organ, acoustic guitar, and Arabian rhythms. At various times I thought of Pink Floyd, Renaissance, and Yatha Sidhra. Another abrupt shift in mood is the other American’s (Roger Mason) contribution. Musea lists him as a Cajun performer yet "On a tapé" is some exceptional banjo picking country blues. Closing out the disc is Alain Markusfeld with "Iguana." If you are familiar with Alain’s solo work you would not recognize his playing. Absent are his intricate guitar riffs. Instead "Iguana" is more like Bill Nelson’s early guitar experiments. Puissance 13 + 2 is such a cornucopia of music styles that it may have something for everyone but you may have to wade through a lot of music you don’t want. To me the best tracks are by Magma, Catharsis, Voyage, and Design and are worth the price of the CD.